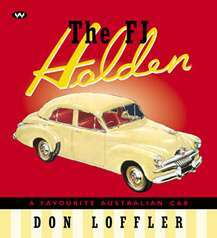 Published to celebrate the fiftieth anniversary of the famous FJ Holden in 2003, this book follows Don Loffler’s previous best-sellers She’s a Beauty: The Story of the First Holdens and Still Holden Together. The FJ Holden is a loving book devoted to the most popular classic Holden model commonly known as the FJ model. It is gorgeously illustrated with 48 pages of full colour and over 500 photographs in black and white, and includes a wealth of history, stories and information about Australia’s best known car.